Sharon D. Nelson is president of the digital forensics, information technology, and information security firm Sensei Enterprises. In addition to serving on numerous noted legal organizations including the ABA’s Cybersecurity Legal Task Force and the ABA’s Standing Committee on Technology and Information Systems, she is president of the Virginia State Bar. 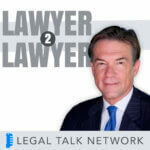 Sharon is also co-host of The Digital Edge and Digital Detectives on the Legal Talk Network. Judy Selby and Sharon Nelson discuss cyber risk management and why it’s necessary for a law firm.